The view of Charleston’s steeple-accented skyline is appealing at any time of day, but especially in the evening. Image by Tom Adkinson. That’s a statement many aspire to make but few can. However, there’s a way to visit the Holy City (a nickname Charleston earned in colonial times for its religious tolerance) that makes it possible for just about everyone to drop that comment into casual conversation – if you’re willing to stretch the truth just a bit. The truth stretching is because “your place” actually is in Mount Pleasant, just across the beautiful Ravenel Bridge, where views across Charleston Harbor showcase the historic city in one direction and Fort Sumter and Sullivan’s Island in the other. “Your place” is The Cottages on Charleston Harbor, a collection of 10 vacation homes that are almost hidden on Patriots Point. Patriots Point’s primary attraction, the aircraft carrier USS Yorktown, is so big (888 feet long) and demanding of your gaze that it’s easy to look past the neatly landscaped cottages just a few hundred yards away. You won’t overlook them twice. 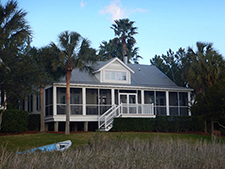 The cottages are a totally relaxing location to use as a base to explore Charleston and the South Carolina Lowcountry. That assumes you even venture away from the cottages in the first place. The Cottages on Charleston Harbor have a rural, Lowcountry look but are only minutes for downtown Charleston. Image by Tom Adkinson. They are homey and comfortable and easy to enjoy. Their pastel exteriors give way to Lowcountry decor inside, where the layout offers two bedrooms, three baths, a full kitchen with full-size appliances and service for six, and an inviting living room, complete with a gas fireplace when evenings turn cool. 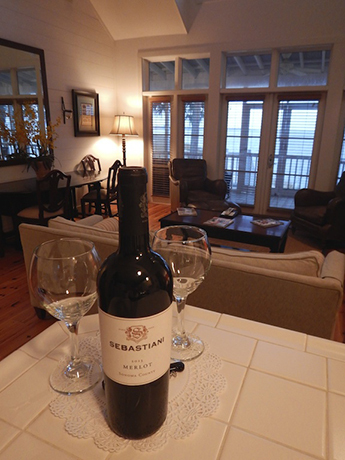 A welcoming bottle of wine is best enjoyed through the French doors on each cottage’s screened-in porch. Image by Tom Adkinson. Perhaps each cottage’s most important space is through the living room’s French doors, which lead to a private screened-in porch that looks onto the harbor. A hammock and rocking chairs entice you to plop down right there and chill out. Outside are a tiny beach and Adirondack chairs where you can watch pleasure boats zip by and observe the massive container ships that count Charleston among their ports around the world. There is a substantial continental breakfast every morning, as well as afternoon snacks (try the triple chocolate cheesecake). There’s a pool for relaxing, along with a fleet of beach cruiser bicycles to explore the neighborhood. If you truly want to stay rooted, there’s even a service that will stock your cottage’s refrigerator to your order – or you can arrange for the resort’s chef to prepare a special dinner for you. Of course, most guests venture out. 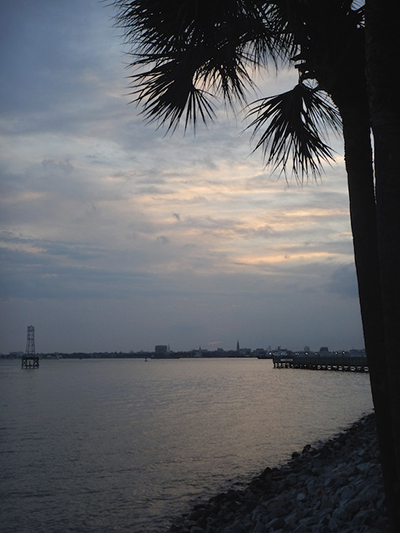 The downtown attractions of Charleston are easy to reach via a water taxi that connects Patriots Point with Waterfront Park and the South Carolina Aquarium. While you stroll – or take a carriage ride —through the city, shop for an authentic Lowcountry craft item, a sweetgrass basket. Trudy Hicks, whose space is at Waterfront Park, will tell you about these treasures. 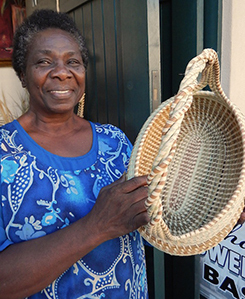 Trudy Hicks sells the famous Lowcountry souvenir of Charleston, sweetgrass baskets, at Waterfront Park. Image by Tom Adkinson. It’s impossible to wander through Charleston and not stop for refreshment or a meal. For a touch of history, enjoy a cocktail in the First Shot Lounge at the Mills House (the hotel opened in 1853), and then let whim, happenstance and bar talk steer you to restaurants such as Coast for seafood, Virginia’s on King for upscale Lowcountry cuisine and Michael’s on the Alley for beef. In Charleston, your restaurant choices seem endless. Whatever you do, just remember the departure time of the evening’s last water taxi back to Patriots Point and the Cottages on Charleston Harbor. Reservations are possible for a single night’s stay, but doing that would only cheat you of a more complete Charleston experience.